Chapter 18: DamID: mapping of in vivo protein-genome interactions using tethered DNA adenine methyltransferase. Modern DNA microarray technologies have evolved over the past 25 years to the point where it is now possible to take many million measurements from a single experiment. 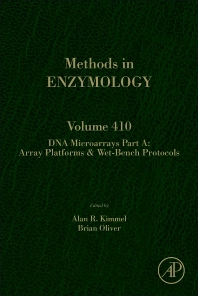 These two volumes, Parts A & B in the Methods in Enzymology series provide methods that will shepard any molecular biologist through the process of planning, performing, and publishing microarray results. Part A starts with an overview of a number of microarray platforms, both commercial and academically produced and includes wet bench protocols for performing traditional expression analysis and derivative techniques such as detection of transcription factor occupancy and chromatin status. Wet-bench protocols and troubleshooting techniques continue into Part B. These techniques are well rooted in traditional molecular biology and while they require traditional care, a researcher that can reproducibly generate beautiful Northern or Southern blots should have no difficulty generating beautiful array hybridizations. Data management is a more recent problem for most biologists. The bulk of Part B provides a range of techniques for data handling. This includes critical issues, from normalization within and between arrays, to uploading your results to the public repositories for array data, and how to integrate data from multiple sources. There are chapters in Part B for both the debutant and the expert bioinformatician. National Institute of Diabetes and Digestive and Kidney Diseases, National Institutes of Health, Bethesda, Maryland, U.S.A.